Big Turkey legs, loads of drink, elaborate costumes, and plenty of merry old English entertainment set to grace the sands of Fawnskin, a suburb of Big Bear. Set during the reign of Queen Elizabeth I of England, you will be transported to the era of the middle ages when jousting was the equivalent of our WWF arm to arm combat. Like most, this Renaissance Faire encourages guests to time travel by wearing costumes, donning their best Brit accent and participate with the performers. You’ll enter all things English in Merry Old Big Bear. You may even encounter some fantastical wizards and unexpected creatures such as centaurs and dragons. Set in England, the renaissance period is the start of the Elizabethan era and it’s most famous writer William Shakespeare. You’ll hear the Queen’s English being spoken, which is NOT what American’s speak and see performers challenge your spirit with skits, magic acts and plenty of commedia dell’arte style performances. The list of performers for this year’s faire is tremendous. While the “renaissance” might first be attributed to Italy, it soon spread during the middle ages throughout Europe and encompassed both cultural and political changes. Here though, only the fun is attributed with a heavy hand on Tom Foolery, fun and silliness. All for a good cause as the money raised by the various activities go to fund scholarships for students and teachers to grow the arts. The faire is 3 weekend in August 2-3, 9-10, 16-17 and is a continuum of mirth and merriment, excitement and education. The village streets lead you past crafts, costumes, food, stages, and games. The Enchanted Shire has performances all day long. There is also an arena for the infamous jousts and a place for pirate battles, dances, and other truly glorious nonsense! 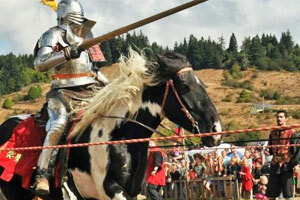 This year’s Renaissance festival has grown in size. You have to make it to Southern California’s playground to be part of the magic, the merriment and the experience that can only be had at the Big Bear Renaissance Faire. What are you waiting for… a gold gilded invitation from the Queen?